St. Martin's Press, 9780312338930, 400pp. For fans of The Red Tent and The Dovekeepers, India Edghill breathes new life into the biblical story of Vashti and Esther with her signature historical richness, epic scope, and sweeping romance. You may know part of the story already, but you only know what history has passed along. The story of how Vashti, Queen of Queens, the most beautiful woman in all the empire, defied the king her husband and so lost her crown. The story of how Ahasuerus, King of Kings, commanded that the most beautiful maidens be sent to his court so he might choose a new queen. And you may know how he set the queen's crown upon the head of the virtuous and beautiful Esther, and how Queen Esther herself defied both king and law to save her people from a treacherous fate. 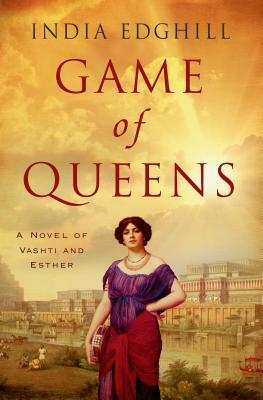 What India Edghill brings us in Game of Queens is the story of power and treachery, blood and deception, bravery and romance that surrounds the court of Ahasuerus and brings to life two of the most celebrated female heroines in all of history. India Edghill is a librarian living in the Mid-Hudson Valley in New York. She is the author of Wisdom's Daughter, which was a Romantic Times Nominee for Best Historical Fiction, Queenmaker and Delilah.